Christmas is a time when people tend to eat and drink a bit more than they should. They also splash out on gifts that they'd never normally purchase. They also, for some reason, combine this with taking up an Olympic sport. As you can probably tell already, I'm not a big skater myself but many people in the UK and the capital are. I'm not down on skating personally, I can see the attraction and romance in it, I just can't do it... So with that in mind, please understand this list of skating rinks in London is graded by the whole experience, not the quality of the skate! This rink is situated directly underneath the London Eye making it a really rather magical experience. In the dark evenings when the Eye is lit up and the Christmas lights around the rink come on, you couldn't wish for a nicer setting to fall and break your ankle... I mean skate! You can combine with a flight on the London Eye for a small break in the price or just solo skate. Prices are £9.45 for adults and children go free (except on the weekend). This has been going on for some years but is a reasonably well kept secret... The magnificent palace of Henry VIII sets the backdrop for one of London's more spectacular skates. Luckily, it's separate from the maze - could you imagine getting out of there on skates? What's more, this year the palace celebrates 500 years of existence so combine it with a look round the palace, it's well worth it! Not to mention of course, the Ice Bar and Café for refreshments. Tickets are £11.50 for adults and £8.00 for children. Imagine skating around with a Christmas fair, food market and vintage fairground rides in the background. Now add in the spectacular archway of the home of English football and you've got skating heaven... The designer outlet at Wembley is to thank and for just £12 (adults) or £10.50 (kids) you can be a part of it! The Natural History Museum, designed by Alfred Waterhouse, is a pretty spectacular sight most of the time. However, now there's a skating rink and Christmas fairy lights adorning the imposing building, it's worth of its own adjective. They've even been considerate enough to add a smaller children's rink so the little ones can practice before they take the plunge on the main rink. Tickets are £15.40 for adults and £10.45 for children. There's a Fortnum's Lodge selling champagne and afternoon tea. Do you need another reason? 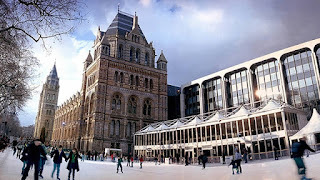 Ok, this is traditionally the most well known of London's winter skate rinks but with the rise of the rink, it's been creative to stay ahead. This year there will also be club nights provided by Ministry of Sound and Island Records. I can't believe you want more reason than that? Prices are £14.60 for adults and £10.10 for children. The rink, creatively is in the dry moat. In my head this is harping back to a great tradition of when the moats froze over and the poor people were invited to skate on it at Christmas. That probably isn't it at all but it's a nice romantic image to end on... Just don't misbehave here, they've got ready made cells! Well that's our favourite rinks in London. An honourable mention goes to the one at Canary Wharf that just didn't make the cut. Purely on the fact that you'd have to be hanging around all those finance people... Do you want that at Christmas?